Above are two pictures of some seed beads I recently purchased. They are such wonderful shapes and colors that I wanted to share them with you. The little diamond shape beads are called Dragon Scales and the others are call o rings. Not sure where they will show up yet. One thing I am sure of is they will be in a freeform peyote creation. This collage shows 3 views of this bracelet. The two ceramic flower beads are handmade by me and are raku fired. The button is made from copper and forged and textured by me. I love the colors in this bracelet--unusual ones for me to choose and I am pleased by how well they go together. 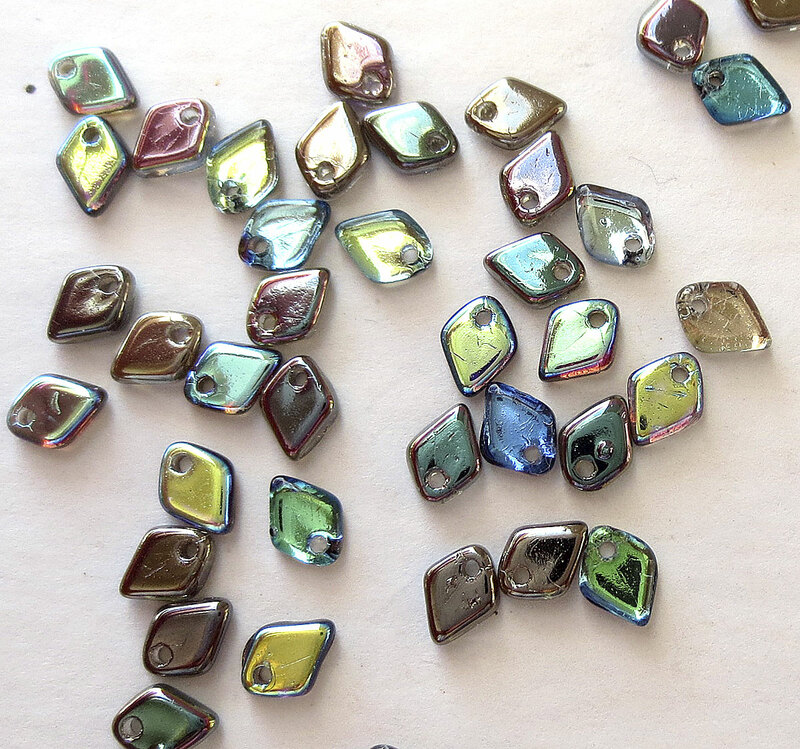 When I began making the bracelet, I was guided by the colors in two ceramic flower beads thatporphed into wonderful shades of red, yellow and green during the reduction phase of the raku firing. Following their lead I just went to town and had a great time makking this one. 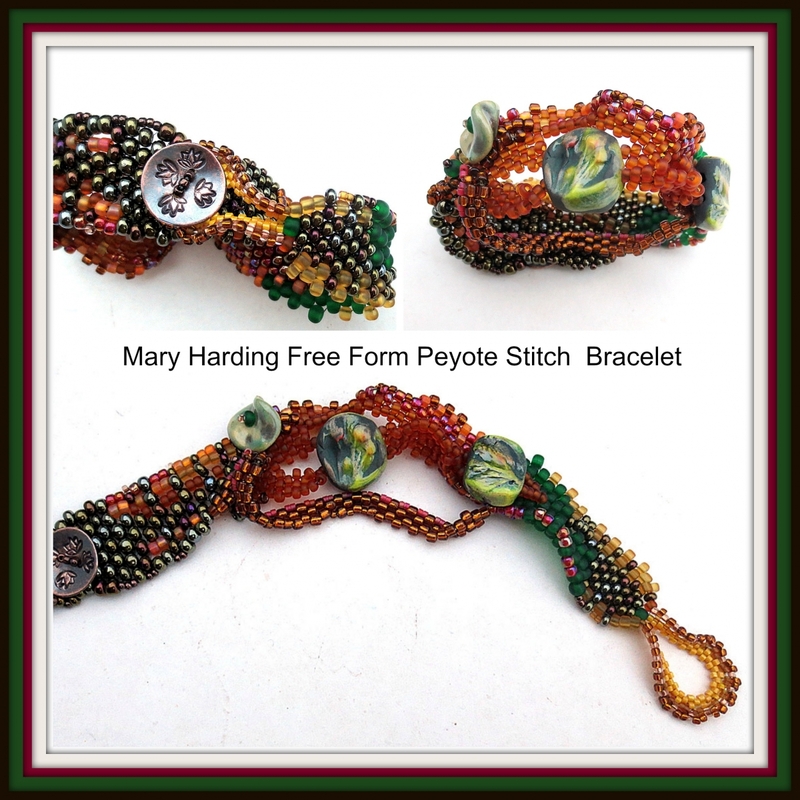 Check out my shop as I have recently added a freeform peyote stitch bracelet (picture and text above) and a simple to follow Free Form Peyote Bracelet ebook to my listings. I wrote the ebook some time ago but it has not been available for several months due to me changing website providers. So now it is here. Yeah!! It is best if you have some knowledge of peyote stitch. I do give some very simple directions for doing peyote stitch. If you need more instruction, I suggest you check out YouTube. You just need to be able to do flat peyote stitch to do freeform. No counting, no patterns to follow, just let your creative spirit run free. This ebook was originally published as part of a beading kit. However, I no longer offer the kit. So it is a stand alone, downloadable, publication now. 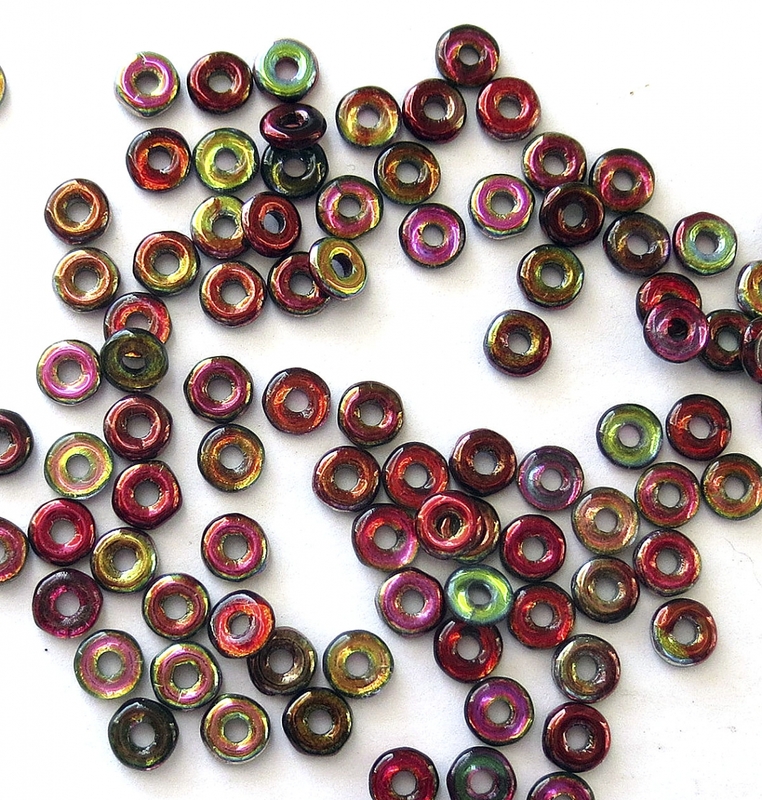 The loose beads in the picture were offered with the kit. I may offer it again, if I get some requests. The ebook is on special right now for $5.00 and of course, no postage. If the beads were to be included the price would be $35.00. The seed beads are excellent quality and I have also included some of my raku beads and a handmade button made by me. Thanks so for stopping by today. Mary, I love your free form bracelets! It's the only kind of beading I've ever been interested in. So organic and colorful-- they have it all! Beautiful. Thanks for the post. I really loves this New Seed Beads bracelet.One of the excellent piece and thank you so much for the piece here.I am actually looking for the best bracelet for my new year party function and I love these pieces more than dress.Thank you so much for the making steps also. This is the kind of thing which is very rare to see for so many days I have been working here, https://www.papersarena.com/ have led me here to this particular post one of the interesting things to see around. Beadwork is my hobby that brings me a lot of positive emotions that help me to relax and unwind from the daily rush. I think that beadwork is a great way to calm your nerves at the end of a busy day. Add to this a glass of red wine - so this is what therapy turned out to be.